The adjusting knob is marked with an arrow indicating the direction required to decrease line pressure to the calipers. The knob rotated all the way out (counter-clockwise) will provide a maximum pressure reduction of 57%. Rotating the know in (clockwise) will incrementally increase line prressure, up to full pressure. If the range of adjustment in the valve is not sufficient to properly balance the vehicle�s bias, changes to other components within the system may be necessary. � Maintains full separation between the front and rear fluid circuits when used with tandem outlet or dual mount master cylinder assemblies. � Bias proportioning adjustment is provided in the rear fluid circuit. � The front circuit has a single inlet and two outlets for optional line routing. � A fluid port with a pressure switch responds instantly to pressure in the front fluid circuit for brake light activation. A wiring pigtail with a protective boot is included with the switch. NOTE: Although the combination valve may mount in some OEM locations, it is not a direct replacement for any OEM unit and may require modifications to the brake lines and/or the mounting location for installation. Bias proportioning adjustments will be specific to each vehicle. 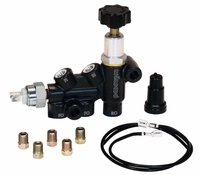 Line Connections: The line connections on the Wilwood combination valve are 3/8-24 with an SAE inverted flare for standard 3/16� (-3) brake line. The supplied tube nuts can be double flared onto any 3/16� brake line. However, if your lines are already flared with 3/8-24 fittings, then the tube nuts are not necessary. 1. The line from the master cylinder for the front brakes connects to the port marked �FI�, (front in), on the top of the combination valve, refer to Figure 1. 2. The two ports on the bottom of the valve marked �FO�, (front out), will be the supply lines to the front calipers. These ports can be used to run individual lines to each caliper. Or if preferred, one port can be blocked, and a single line run from either �FO� port to a �T� plumbed downstream, splitting the lines to feed each front caliper. The function of the valve will not change. 3. The line from the master cylinder for the rear brakes connects to the port marked �RI�, (rear in), on the top of the proportioning valve. 4. The single port marked �RO�, (rear out), connects to the line going to the back of the car to feed the rear calipers. NOTE: Tube wrenches are always preferred for tightening the fittings. 1. Before connecting the lead wires, cut the ends (that do not have the clip) on a 45� angle. Coat both cut ends with Dielectric Grease to ease slidingthewiresthroughtheholesinthedustboot. Slidetheclipsonto the spade connectors and cover with the dust boot. It can be used when a master cylinder is mounted equal to or below the horizontal plane of the calipers or drum brake wheel cylinders. This valve prevents fluid flow-back to the master cylinder reservoir which can cause excessive brake travel or �pumping� of the pedal to engage brakes. Install the valve as close as possible to the master cylinder and position the end marked �M.C.� toward the master cylinder and the end marked �OUT� toward the brakes. Ports in the valve are 1/8-27 NPT threads and will accept standard inverted flare tube nut adapters. A residual pressure valve can be used when a master cylinder is mounted equal to or below the horizontal plane of the calipers or drum brake wheel cylinders. 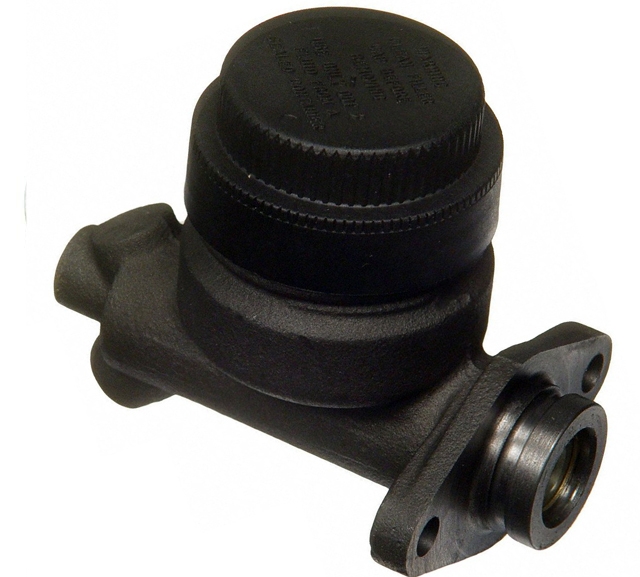 This valve prevents fluid flow-back to the master cylinder reservoir which can cause excessive brake travel or �pumping� of the pedal to engage brakes.